Cream cheese, ginger snaps and chocolate. That's all you need to make these spicy and elegant cookie balls—one of the easiest cookie ball recipes around! Mix cream cheese and 2 cups gingersnap crumbs until blended. Shape into 30 (1-inch) balls; place in single layer in shallow pan. Freeze 10 min. 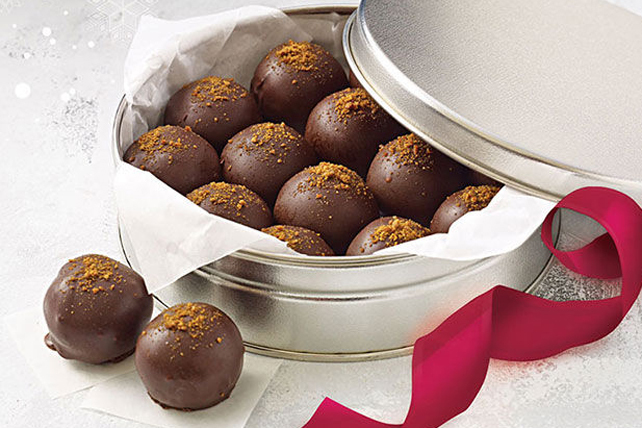 Dip cookie balls in chocolate, turning to completely coat each ball; place in single layer in shallow parchment paper-lined pan. Sprinkle with remaining gingersnap crumbs. To easily coat cookie balls with the melted chocolate, add cookie balls, in batches, to bowl of melted chocolate. Use 2 forks to roll cookie balls in chocolate until evenly coated. Remove cookie balls with forks, letting excess chocolate drip back into bowl. Place cookie balls in prepared pan; let stand until firm. Crushing gingersnaps is a cinch with a rolling pin and a resealable plastic bag. Or, process the gingersnaps in your food processor or blender. You will need to crush about 40 gingersnaps to get the 2-1/4 cups crumbs needed to prepare this recipe.